Educators around the world are excited about TypeTastic, and are finding creative ways to include it into all sorts of lessons with lots of different students—and they are sharing their experiences on their blogs! So, if you’re an educator wondering whether TypeTastic will work in your classroom, then check out these amazing recommendations from a trio of teacher bloggers who absolutely love TypeTastic! On her “Tech Savvy Mama” blog, Leticia Barr presents seven great reasons why educators should consider using TypeTastic in their classrooms. It’s fun, easy to navigate, and the read-aloud instruction option in Keyboarding Kickstart exercises makes it easy to use for even non-fluent readers, and that’s just the beginning! She also recommends five easy ways to integrate it into daily instruction, like using it as a warm up for computer lab time, or offering it as a fun—but educational—option during a rainy-day recess. Surprise! Even adults can use Typetastic to improve their keyboard typing skills. Jen Sykes is a veteran teacher, mother, and “hunt-and-peck” typist who blogs at “Hello Mrs. Sykes.” After only 30 minutes of playing, she noticed huge improvement in her home row typing! Jen loves the how engaging the games are, and how the characters, colors, and rewards make typing fun for kids (and adults, too). Crystal Rapinchuk is passionate about promoting engaging, hands-on ways to teach kids, which means that she’s in love with TypeTastic. On her blog “Surviving a Teacher’s Salary,” she writes that when school budgets are tight, a free typing resource can be invaluable to teachers trying to get the most out of their dollars. She points out how great TypeTastic is for strengthening letter recognition and coordination skills, and is also color-coded for visual learners. On top of that, her sons had so much fun playing the games and trying to beat their own high scores! 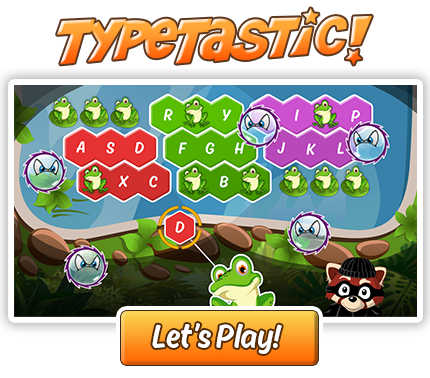 These teacher/bloggers agree that TypeTastic is a fantastic tool that teachers can incorporate into many different areas of the classroom, and the different levels within the games make it fun and helpful for students of all ages and skill levels. Click here to try it for FREE in your classroom! Already tried TypeTastic? We are just at the beginning of our journey and want to know what you think! We promise to listen and improve according to user feedback.